The all-new fuel-efficient Spark offers street-savvy style and spirited performance thanks to a standard ECOTEC® 1.4L dual overhead cam I-4 engine and an impressive estimated 41 MPG highway. Get control with a standard 5-speed manual transmission. Or opt for the available Continuously Variable Transmission (CVT). CVT seamlessly adjusts to driver throttle input and speed for a comfortable and effortless ride. Stylish headlamps make for a striking appearance. 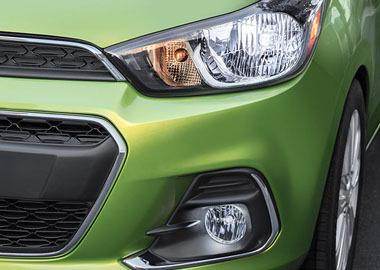 In profile view, it's easy to see the sleek lines and sporty design of the 2016 Spark. 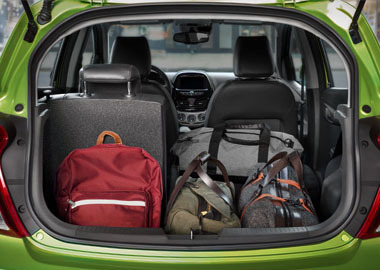 Spark has all the space you need and the comfort you want. Like room for four, available heated front seats, and 27.2 cu. ft. of cargo room to accommodate all the stuff you’d need for a weekend getaway. Spark is the first car in its class to offer Apple CarPlay™ and Android Auto™ compatibility. With this intuitive technology, you can interact with certain features of your smartphone using voice commands or the MyLink touch-screen display in your car. It’s smart, convenient and helps you keep your eyes on the road instead of your phone. The days of searching for a Wi-Fi connection are over. When your car is on, the available built-in OnStar® 4G LTE Wi-Fi® mobile hotspot is automatically on too. It’s just another one of the many ways to stay connected. The standard Chevrolet MyLink 7-inch diagonal touch-screen is like your own personalized command center. One touch of a fingertip gives you access to connectivity, entertainment and everything else you need to get around the city efficiently. Slip into something more comfortable — the driver’s seat. From the premium materials on the dashboard to the all-new instrument cluster, Spark is decked out from door to door. The sporty color-coordinated seats are designed to keep you comfortable, with available leatherette heated seats on the 2LT model. Plus, cool ambient lighting creates a relaxing atmosphere. 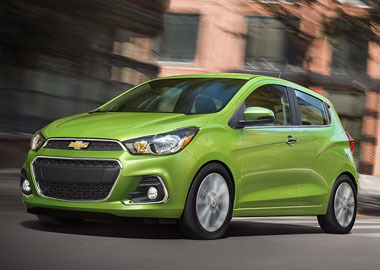 The 2016 Spark is designed for a confident drive every time you get behind the wheel. In addition to 10 standard air bags, 4-wheel antilock brakes and a high-strength steel safety cage, Spark offers a number of available safety technologies to help you stay safe on the road.